Israfel has the unique ability to multiply into two forms of itself when split. It possesses a fairly weak AT field but makes up for it with a somewhat devastating laser weapon and a set of sharp claws. This Angel is also agile too. Both Shinji and Asuka tackle this Angel but are soundly defeated when it splits in two. 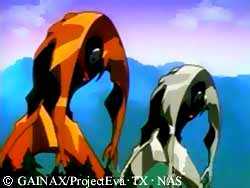 However, after Shinji and Asuka synchronize with each other, Israfel is defeated.